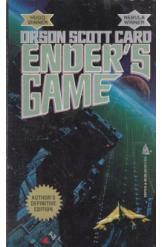 Ender's Game by Orson Scott Card, Sci Fi. Book is in good condition, all pages intact. The Earth government is recruiting brilliant children to defeat an overwhelming alien enemy. Ender Wiggin is the brightest of them all, but the training might destroy him, and there is more to the war games than anyone knows. Book one of the Ender series.